The dumping of aluminium downstream products in the Indian market has turned the operation of domestic manufacturers of these items unviable. While local downstream manufacturers are looking at exports as an option to stay in business, low export incentives and lower global prices are eroding their margins threatening their survival. Imports from China have magnified after the US-China trade conflict. The downstream manufacturers are also unable to expand their export market due to limited incentives for them in the Merchandise Exports from India Scheme (MEIS). Unlike the big primary producers, the secondary players face the price disadvantage as they have to buy aluminium from the primary makers at a premium of 14 per cent over London Metal Exchange prices and then compete with them in downstream product sales. “Chinese manufacturers, with the help of an export incentive of 16 per cent, are dumping downstream products in India at throwaway prices, particularly after the US blockage. Our local downstream manufacturers, who are mainly in micro, small & medium enterprises (MSME) sector can’t protect themselves from this onslaught of Chinese dumping and may not survive long if it continues. 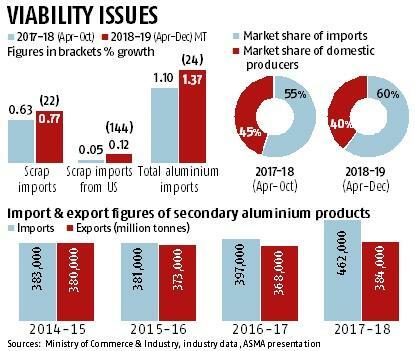 They can’t increase their export markets with the help of a meagre 2-3 per cent MEIS benefits only when their market is being taken away by foreign goods,” Anil Agarwal, patron, Aluminium Secondary Manufacturers Association (ASMA) said in an emailed response. India has turned into a favoured hunting ground because of its lax tax structure on downstream imports. 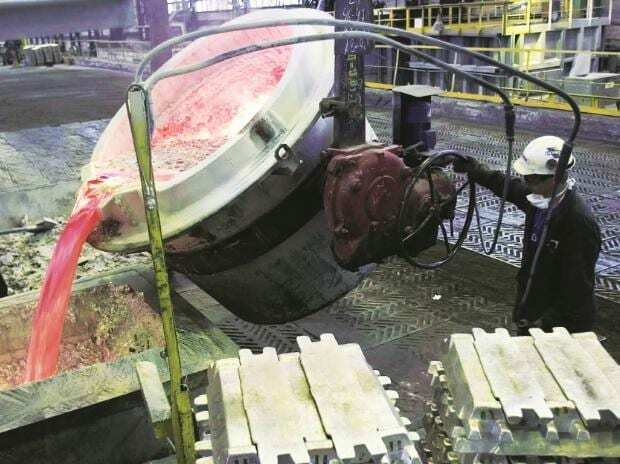 The downstream aluminium products invite import duty of 7.5 per cent, against 20-30 per cent in Southeast Asian nations having free trade agreements (FTAs) with India. That apart, China, in a bid to incentivise its secondary manufacturers, provides an export incentive of 16 per cent. Presently, the share of imports in the country’s aluminium consumption pie had reached a staggering 60 per cent. ASMA feels the share of imports is growing alarmingly because of dumping of Chinese downstream products in the form of aluminium sheets, foils, wire rods, and extrusions. These products are getting diverted to India in the fallout of the US-China trade war, leading to enhanced tariff by the US on Chinese products. “The domestic downstream product manufacturers like us are getting threatened, not the primary producers,” Agarwal noted. ASMA feels the Government of India needs to step in and protect the indigenous aluminium downstream industry by levying additional tariffs or anti-dumping duty on Chinese products. The government also needs to ensure the products of Chinese origin are not re-exported via Southeast Asian countries enjoying FTAs with India. The country’s downstream aluminium ecosystem is mostly unorganised and cluttered by the presence of 3,500 units, mostly in the MSME sector. The units are constrained to run at 55-60 per cent of rated capacities as they don’t get raw materials at competitive prices.